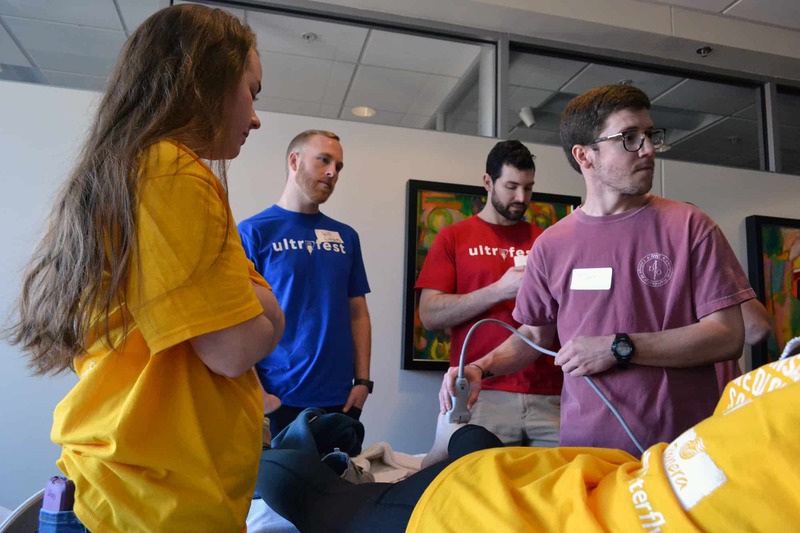 UAMS faculty work as volunteer instructors demonstrating ultrasound applications on a college student volunteer as medical students observe and learn during Ultrafest. Nov. 28, 2018 | To most people, ultrasound is associated with taking pictures of babies in the womb. But it has become part of a technology revolution that is helping physicians provide better care for all types of patients. Students learn as ultrasound is used to examine a volunteer’s heel. More than 100 students from the UAMS College of Medicine as well as other medical schools in Arkansas recently gathered on the 10th floor of the Winthrop P. Rockefeller Cancer Institute for a Saturday of learning about the clinical applications of ultrasound technology. The event, called Ultrafest, was intended to give students exposure to and hands-on experience with a variety of point-of-care ultrasound applications, from obstetrics to applications in cardiovascular and ophthalmic exams to ultrasound-guided procedures. Ultrafest was first started at the University of California Irvine in 2012. The idea for the event has since spread to several medical schools across the country. This was the first event of its kind in the Arkansas region. With changes in technology, the ultrasound may soon replace the stethoscope as the staple tool of the physician. 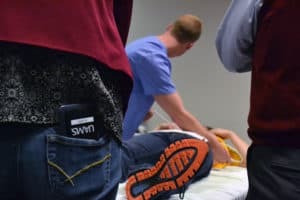 “It’s kind of a theory that bedside or even ‘pocket’ ultrasound is going to replace the stethoscope as the staple tool of the physician,” agreed John Martindale, a third-year medical student who helped organize the event. Following a keynote address from Creagh Boulger, M.D., emergency medicine faculty and associate director of ultrasound at Ohio State University, the morning was spent with medical students learning from instructors, who demonstrated ultrasound techniques and applications on volunteer “patients,” models who were recruited from nearby universities. During lunch, students had the opportunity to form teams and compete in a fun and friendly ultrasound competition, further testing their skills and reinforcing concepts. Medical students got hands-on experience with ultrasound equipment during Ultrafest. Of course, the volunteer patients weren’t the only ones there to learn. Medical students who attended also befitted tremendously, said Martindale, who is part of the UAMS Ultrasound Student Interest Group leadership team. Organizing the event was a significant undertaking by the student group and faculty mentors involving needs such as room and audiovisual reservations, recruiting faculty instructors and volunteer patients, advertising to students, catering and inviting industry vendors of ultrasound equipment to have enough machines for the event. 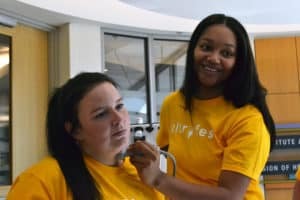 Students had the opportunity to use some of the “latest and greatest” machines marketed towards point-of-care ultrasound users. 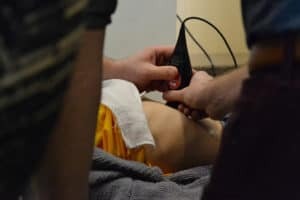 Perhaps surprisingly, many medical students don’t get consistent exposure to ultrasound during their medical education, even with its growing importance in patient care, Russ said. 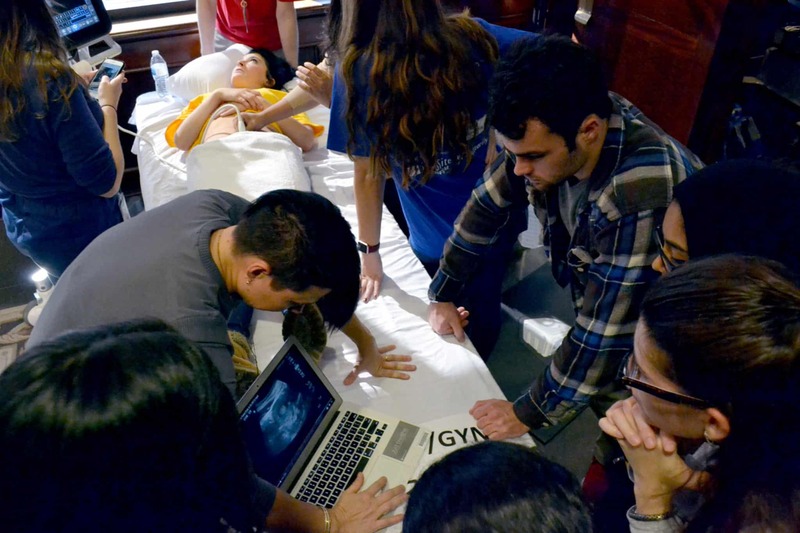 Medical students watch as faculty instructors demonstrate ultrasound techniques during Ultrafest. Both Martindale and Russ said, with this year’s success, they plan to make Ultrafest into an annual event. 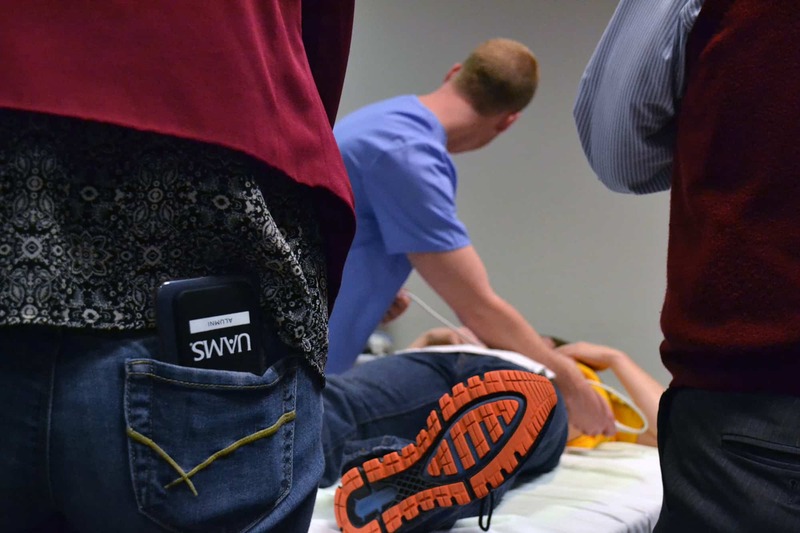 “Bedside ultrasound is quickly becoming a depended-upon resource in the medical field. Everyone is familiar with traditional uses of ultrasound in medicine — looking at babies in the womb, but the way we use it at the bedside is what has made it such as powerful tool,” Martindale said.